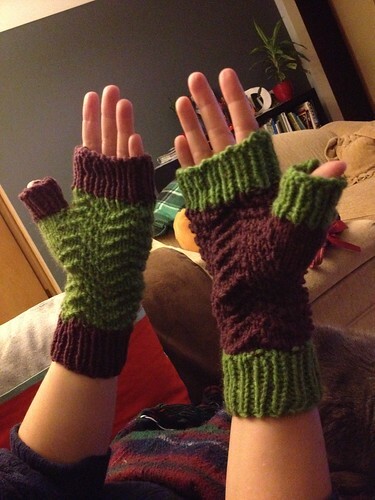 Made For: my sister, who requested fingerless mitts to wear in her office — except these turned out too thick for office-wear, so I guess I need to keep on knittin’. 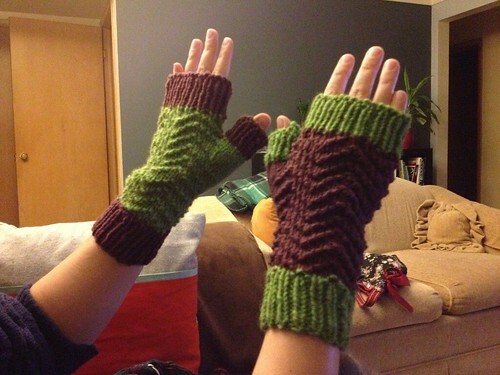 So, like I said, these turned out to be too thick and warm for casual wear around an office. I have another pattern in mind that will hopefully work better. 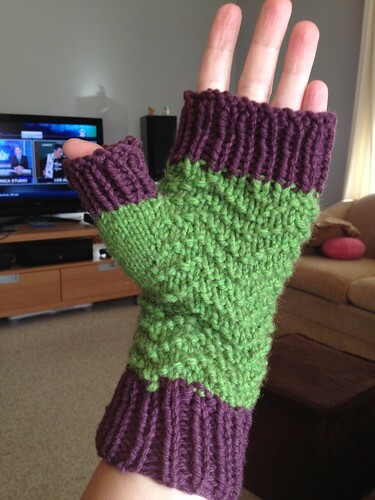 I found this pattern a couple months ago, though, and I just really adored it. I wanted to try it! I also dug through my stash to find a yarn would work; I guess I just don’t buy many worsted-weight yarns to stash. I’m a DK-weight yarn fan. The yarn I used here, though, is two skeins of Zealana merino blends that I won from the Minnesota yarn shop hop a couple years ago. They have both been discontinued now, but they were nice to work with. The green yarn is part possum! I thought that was pretty unique. Very quick to knit, though I did get a little hung up around the pattern repeat and the thumb increases a couple of times. 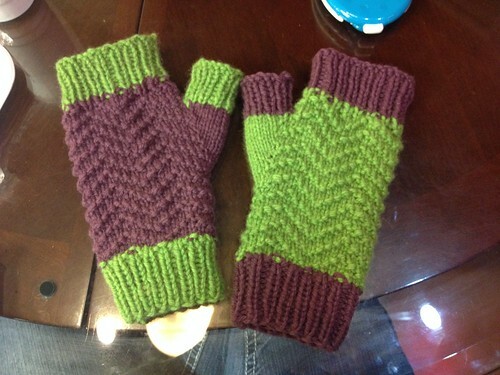 I think the green-bodied mitt might be just a couple rows longer than the purple-bodied mitt, but it’s not noticeable during wear. I’m calling this a very successful project! « I can be an expert.